Teaming up for an epic, if somewhat oddball, pairing, two acts who first found fame in the mid-’90s, alt rockers Cake and singer-songwriter Ben Folds, will soon embark on a co-headlining summer tour, which brings them to Folds’ home of Nashville Aug. 21 for a performance at Ascend Ampitheater with electro-folk up and comers Tall Heights. Cake’s first Nashville show proper in seven years (in support of their last LP, which they’re finally preparing to follow up), and Folds’ latest in a string of always fresh local outings, this tours promises an excellent blend of nostalgia and fresh tunes, and tickets are still available here. We’re also excited to announce that we’re giving away a pair of tickets to one lucky fan! Read on for more about the show, and enter for a chance to win below. More than 25 years into their career, west coast rockers Cake are certifiable modern legends in the alt rock scene, remembered best for smash singles like “The Distance” and “Shirt Skirt/Long Jacket,” but rounded out by a catalogue of some unbelievable songs. Incorporating elements of hip hop, folk, Mariachi, funk, country, and more into their eclectic, trumpet-laden rock sound, and noted for singer John McCrea’s sarcastic lyricism and monotone style, the long-running act, despite some lineup shuffles, have never stopping working, continuing to tour and tweak their sound, and settling into a dependable act for music festival appearances in recent years. Always a bit hard to pin down, Cake found a cult following and critical acclaim after forming in Sacramento in the early ’90s, and became an unlikely commercial success by the latter half of the decade, earning platinum albums and embarking on increasingly high-profile world tours. Since springing back to recognition in 2011 with with their overdue sixth album, Showroom of Compassion, Cake have taken their time crafting a followup, initially announced for 2014, but slowed by lineup changes, tours, and a prolonged writing process. Finally set to drop a new effort this year, the band recently returned to their eclectic roots with new single “Sinking Ship,” and should have plenty more in store when they bring their unrivaled live show back to Nashville for the first time in seven years. Not only a modern musical legend, but also an integral part of the Nashville music scene for a number of years (not to mention the recent savior of historic RCA Studio A), North Carolina born singer, songwriter, and producer Ben Folds first rose to fame in the ’90s with beloved alt rock trio Ben Folds Five. Though they’ve reunited for stints here and there, even releasing an unlikely new LP in 2012, since the band’s original split in 2000, after achieving international acclaim, Ben has largely been operating as a solo artist, finding an instant classic in his 2001 debut Rockin’ the Suburbs, as well as subsequent followups, 2005’s Songs for Silverman and 2008’s Way to Normal. In the decade since, Ben’s settled into a legacy as famed rocker and big-ticket touring artist, sought-after producer, symphonic composer, pop culture icon, and television personality, and, in addition to that Ben Folds Five reunion album, has released compilations, live albums, and full-length collaborative efforts with the likes of Nick Hornby and yMusic. A magnetic, charming, and supremely talented performer, the piano man is one of the most veritable, enduring, and talented performers in the world, and though he does play Nashville semi-regularly in some format or another, each and every outing is special and unique. Formed nearly a decade ago in Boston, duo Tall Heights have honed their electro-laced, folk-infused indie sound over two excellent full-lengths, most recently making the jump to Sony with 2016’s Neptune. Channeling a style reminiscent of groups like Arcade Fire and Fleet Foxes, they’re a little less weird than Cake and a little more polished and contemporary than Folds, but, still, manage to find a sweet spot between the two and should make for an excellent opening act. A string of recent singles have been especially great, and sound likely to really help the band blow up with their next release- show up early and see what they’re all about! Winner will be announced Monday, Aug. 20 at 12 p.m. CDT, and will receive one pair of tickets. Good luck! Win Tix To Cake & Ben Folds at Ascend Amphitheater! 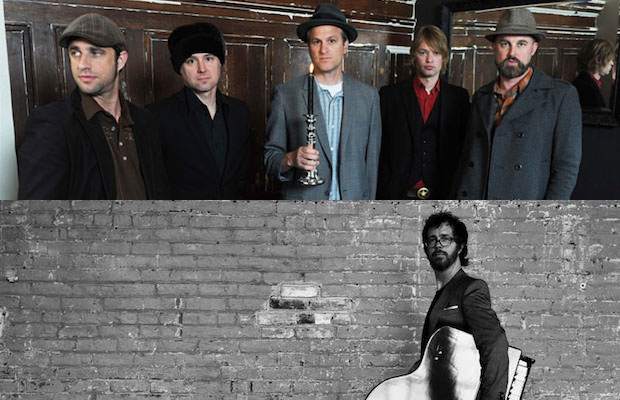 Cake, Ben Folds, and Tall Heights will perform Tuesday, Aug. 21 at Ascend Amphitheater. The show is all ages, begins at 7 p.m., and tickets are available to purchase for $35-75.